I started The Marilyn by making a skull cap out of yellow craft foam. 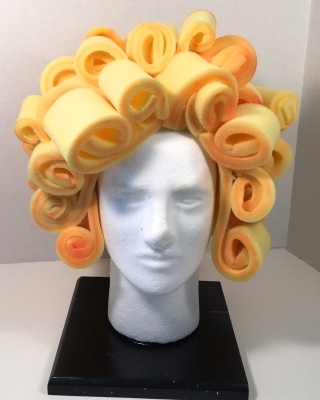 All of the curls were made using open cell foam (like upholstery foam) that I ordered online from the Foam Factory (they have lots of great colors!). 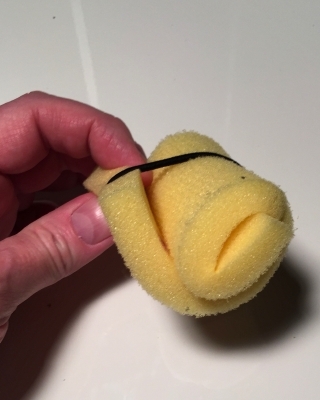 They actually consider this specific foam an "acoustic" foam, though it is smooth on both sides. 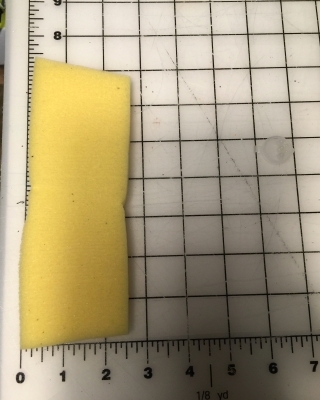 Since the smallest thickness this foam comes in is 1 inch, I had to first cut long strips of the foam that were 2.5 inches wide using my scroll saw (so the strips were 2.5 inches wide by the length of one side of the foam, which is about 48 inches long. Then I turned the longs strips on their side and (very carefully!) cut down their thickness to only 1/2 inch. I then took my long 1/2" thick strips and cut short lengths which varied anywhere from 5 to 8 inches long. 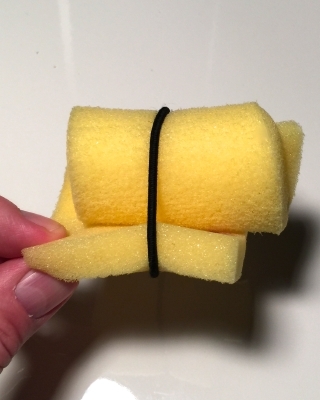 I took my hot glue gun (on low setting) and rolled up the short strip, glueing as I went along. I rolled them kind of crooked so they looked more like a real curl. I took a hair pony and wrapped it around the curl until the glue dried. I rolled & glued about 65 curls of varying length and size; small, medium and large sizes. 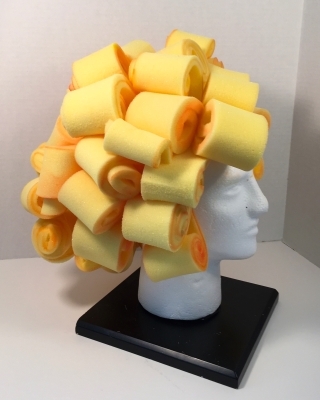 After I had all my curls rolled up and painted, I just started glueing them to the skull cap by doing a front row first, twisting and turning them as I glued them on. Then I just kept going and glueing them all over the skull cap until the whole head was covered.